Whether you are craving fresh harvests during the winter or live in an area without gardening space, you can grow edibles in your own indoor garden. Winter always seems to sneak up on me. It’s not until the first snowfall that I consider the growing season over. Up until then, I am still clipping hearty herbs and fall greens. Once the snow falls, I am reminded that soon the ground will be frozen, and the garden covered with a heavy winter blanket. I start to miss freshly harvested greens quickly. 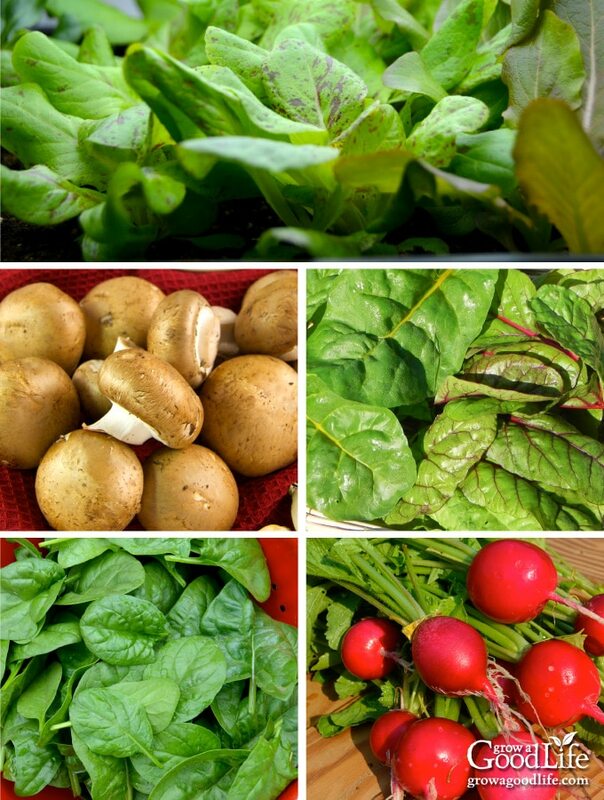 Most years, I have a good supply of fall greens such as lettuce, spinach, chard, kale, pak choi, and other leafy greens to fill the refrigerator before the hard freeze. Some years, I lose my fall greens to the hungry deer as they prepare for winter too. Since I can’t garden outside during winter, I began experimenting with growing food indoors. I started with herbs, and then progressed to salad greens and more. 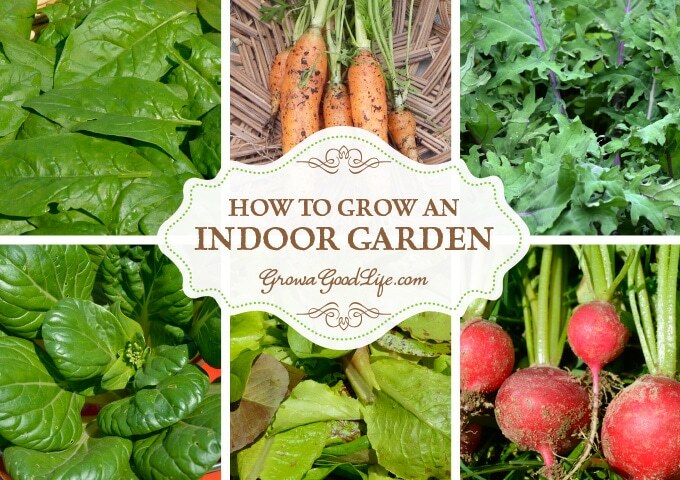 What Can You Grow in an Indoor Garden? Over the years, I have tried growing edibles indoors in winter using these DIY Grow Light Shelves. It is amazing what you can grow with just a little effort. Harvesting fresh vegetables and herbs adds lots of flavor to winter comfort foods. For the best results, choose plants that will grow under artificial light, mature quickly, and stay compact enough to grow in containers without outgrowing their space. Growing beets indoors will provide you with delicious beet greens and delicate baby beets. Beet roots will need deep pots, at least 6-inches high. Harvest: Ready to harvest as baby beet greens in about 6-weeks. Harvest whole plant by cutting at the soil surface, or clip a few greens from outer edge of each plant and allow the plant to continue growing. Harvest young baby beets in about 30 days depending on the variety. Varieties to Consider: Detroit Dark Red Beets, Golden Boy Beets, Chioggia Beets, or this Gourmet Beet Blend for variety. These Asian cabbage greens grow quickly and need lots of water, so they will benefit from a larger container with more soil to hold moisture. Bok Choy or Pac Choi is a delicious addition to soups, stir-fries, and salads. Harvest: Ready to harvest whole in 4-weeks at baby stage. They tend to bolt quickly, so go ahead and harvest them small and sow more seeds, or snip the outer leaves and let the plants continue growing. Varieties to Consider: Bok Choy Tatsoi Rosette, and Bok Choy Toy Choy. Short and round carrot varieties grow very well in 6-inch deep pots. Choose a deeper pot for longer varieties. Harvest: Baby carrots are ready to harvest in 6-8 weeks. Pull gently from the soil as needed for baby carrots, or allow them to develop further. Varieties to Consider: Parisian, Little Finger, and Thumbelina. If you can grow houseplants, you can grow herbs inside on a sunny windowsill. Adding artificial lighting increases the selection of herbs you can grow inside. Harvest: Keep plants compact by trimming and harvesting frequently. Varieties to Consider: Cilantro, Genovese Basil, Italian Parsley, Oregano, Chives, Thyme, and Sage. 5 Herbs That Thrive Inside All Winter to learn more. Young kale has a milder and sweeter flavor than mature kale. Harvest: Ready to harvest at baby stage in about 4-weeks. Snip outer leaves allowing the plants to continue to produce. Varieties to Consider: Red Winter Kale, Dwarf Blue Curled Kale, and Italian Nero Toscana Kale. Leaf lettuce varieties mature quickly for salads and sandwich toppings. There are so many varieties with various colors, leaf shapes, and flavors. Harvest: Snip outer leaves allowing the center of the plants to continue to produce. 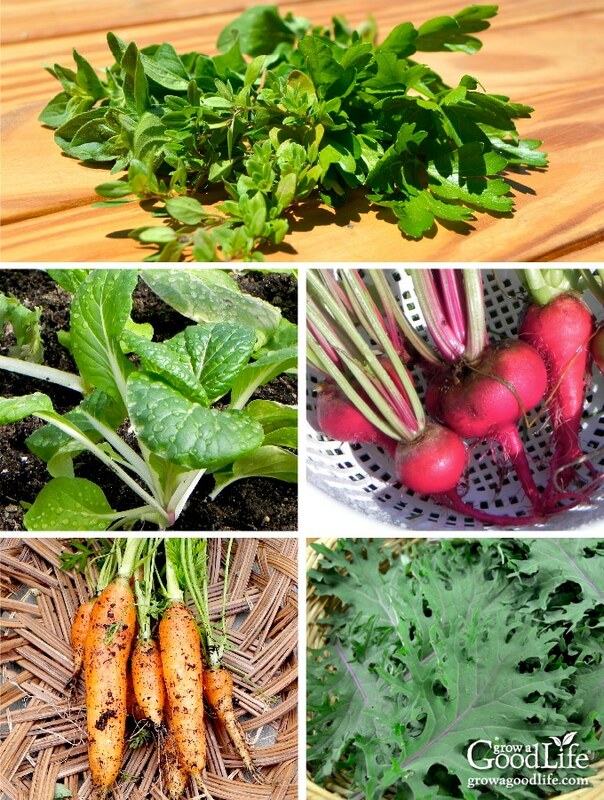 Varieties to Consider: Black Seeded Simpson, Tom Thumb, and Mesclun Mix. This Homemade Italian Salad Dressing is perfect for winter salads. Young edible vegetables and herbs harvested within weeks of sprouting. The tender sprouts are very flavorful and nutrient dense. Harvest: Ready to harvest when the first true leaves unfurl in 7-14 days. Snip the right above the soil line. Varieties to Consider: Pea Shoots, Cress, Kale, and any Mesclun Mix or Microgreen Mix. Mushroom kits have made it so easy to grow mushrooms indoors. They come in a complete package with full instructions. Enjoy your homegrown mushrooms in soups, sauces, and sauté with other veggies and meats. Harvest: Ready to harvest in just 2-weeks. Kit Varieties to Consider: Brown Oyster Mushrooms, Pink Oyster Mushrooms, or Shiitake Mushrooms. Young mustard greens are mild-flavored and add a peppery dijon-ish flavor to salads. Older leaves taste better steamed, boiled or braised. They add a tasty mustard flavor to soups and stir-fries. Harvest: Ready to harvest as baby greens in about 4 weeks once the leaves are 3-4-inches tall. Snip the outer leaves and let the plant continue to produce new growth. Varieties to Consider: Florida Broadleaf Mustard, Tendergreen Mustard Spinach, or a mix of varieties in this Must Have Mustards Baby Greens Seeds collection. Very fast-growing and their peppery flavor adds a kick to soups and salads. Harvest: Ready for harvest in about 4-weeks or when the radish is approximately 1-inch diameter. The greens are edible too. Varieties to Consider: Cherry Belle, French Breakfast, and Easter Egg Blend. Scallions or green onions are grown mostly for their greens, which have a mild onion flavor. Enjoy snipped greens in stir-frys, salads, in sandwiches, or in any recipe that you would use normally use onions. Harvest: Ready to harvest greens in about 30 days depending on the variety. Begin trimming foliage when the scallions reach 4-inches tall as needed for meals. Greens will continue to grow and scallions will get larger over time. Varieties to Consider: Evergreen Bunching Onion, Italian Red Bunching Onions, and Tokyo Long White Bunching Onions. Check out How to Grow Onions from Seed for more detailed information. A shortcut to harvesting scallion greens quicker is to regrow from supermarket scallions. Use the greens for cooking and plant the bulb. Leave about 2-inches with roots attached. Plant about 1-inch deep in potting soil. Green shoots will emerge from the tops of the bulbs in only a few days. The vitamin-rich and tasty dark-green leaves are excellent for salads and winter soups. Harvest: Ready to harvest in a little over a month as baby spinach. Snip outer leaves allowing the plants to continue to produce. Varieties to Consider: Lavewa, Bloomsdale, Space, and Tyee. Swiss chard leaves are tender and taste similar to beet greens and spinach. The crunchy stems are slightly sweet and have a similar taste and texture with celery and can be used in soups and stews. Swiss Chards grow upright foliage. Transplant chard seedlings to larger containers to prevent the plant from becoming top heavy. Harvest: Ready to harvest in about 4 weeks as baby greens. Cut outer leaves at the base of the plant. New leaves grow from the center of the plant. Varieties to Consider: Bright Lights Chard, Fordhook Chard, or a colorful mix of baby green in this Apple Blossom Swiss Chard Blend. Grow Lights: See how to Build a Grow Light System here. Growing Containers: Gather up pots or containers to grow your indoor garden. Pots or containers that are 4-inches deep work well for most greens while carrots need at least 6 inches. Consider using window boxes, or recycled bakery or produce containers. Use plastic trays beneath containers to prevent water from dripping. Soil: Select an organic, all-purpose potting mix for your indoor garden. Fertilize plants with a weak solution of Fish Emulsion when leaves show signs of stress. Seeds or Purchased Seedlings: Buy seeds or purchase plants. Herbs mature slowly, so grow from established purchased plants for a fast harvest. Build or assemble your grow light system and locate in a cool area such as a basement or spare room. Try to keep it away from wood stoves and other heat sources because warm temperatures will cause the plants to bolt, or go to seed prematurely instead of producing a continuous harvest. If growing from seed, follow sowing instructions on the back of the seed package and keep soil evenly moist until the seeds germinate. Also see 10 steps to starting seedlings indoors. Purchased herb seedlings may need repotting if roots are showing through the drain holes. Keep the lights about 2-inches above the plants. Adjust the lights as the plants grow. Plants grown under artificial light need at least 12-16 hours of light each day. I set my Power Strip Timer for 16 hours on, then 8 hours off. Water twice a week or when the soil surface feels dry. Harvest and enjoy fresh, nutritious edibles throughout the cold, winter months. Whether you are craving freshly grown harvests during the winter or live in an area without gardening space, I hope this gives you some encouragement to start growing edibles in your own indoor garden. This article was originally published on November 22, 2014. It has been updated with additional information, photos, and video. Thanks for the post, i’m going to give the DIY grow shelves a go. I love growing microgreens, they really step up the look of your dishes. Apparently they are also a lot higher in nutrients than matured greens, but most importantly they taste better. My dad got us a little indoor grower for herbs and such, but I really want to use it for lettuce and sprouts during the winter! I love all these ideas! We have a big garden in the summer/fall. Maybe we’ll have to try growing some stuff inside! Hi! thanks for all the tips. I was wanting to start seeds indoors and hopefully try the winter indoor gardening you mentioned. I was wondering if it would be beneficial to have my basement growing station near a window for some natural light as well? Would that make a difference, positive or negative? Thanks! Kristin, Natural light would absolutely be a benefit to your plants. Although, I would still use lights in the winter as well because the sun isn’t very strong. Nice list and great guidance for growing those indoor. 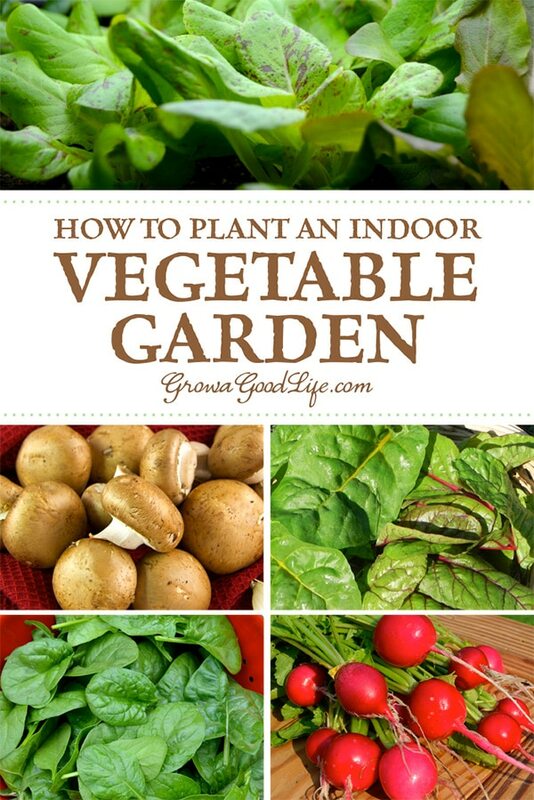 Excellent information on indoor gardening. Thanks a lot for sharing your knowledge. Thank you for a nice article! Is there a reason other plants, such as a tomato or zucchini wouldn’t work indoors under lights (assuming space is available of course)? We move from CA to Oregon a year ago and our first harvest here was less than we expected I’m afraid. Now were getting ready to start our seeds indoors in hopes of a better harvest this year. The herbs we started a couple weeks are already looking great. Ahhh fresh cilantro! I’m trying to figure out whether it is better to grow my plants in a grow tent with an HID light or outside on my balcony. I want to make sure that growing inside of a grow tent with a Sun lamp and soil is potting mixture does not change the flavor of my vegetables. My balconies are very shady and I’m trying to get the best quality and taste from my crops. How much added electrical cost does maintaining an indoor garden incur on a monthly basis? Sorry, I don’t keep track of that. It doesn’t have a huge impact in my average electric bill. Newer T8 lights are supposed to be more energy efficient than T12. I will swap over eventually. Thanks for linking up at Fridays Unfolded last week. This post is being featured at this week’s party at More Than Mommies. Stop by to grab a button for your sidebar! 🙂 Happy Friday! Thank you for sharing at Real Food Friday! We hope to see you again tonight. Just a note a let you know that your post has been chosen as one of my features on this weeks Real Food Fridays blog hop that goes live on Thursday @7pm EST. Thanks so much for sharing and being part of Real Food Fridays! What a great resource! I do want to grow some things inside, but I don’t think I’m ready for a big system yet. Yours looks lovely so thanks for sharing! What a great post and loading with so much important information about gardening. Thanks so much for sharing on Real Food Fridays blog hop. Pinned & twitted. I recently moved some of my plants indoor- mint, green onion, lemon and Basil. They have been holding up well till now. Hope they survive through the season. Thank you for linking up at WUW! Great resource – thanks for the post. Do you find that indoor grown herbs and greens are as flavorful as outdoor grown? To me they are blander when grown indoors. Maybe I’m not using the best soil indoors, or maybe exposure to the weather makes them develop more flavor for some reason? Janet, I don’t detect much of a difference in flavor in herbs. I do harvest most greens at baby stage so the flavor seems more delicate than full grown plants. Overall, the home grown herbs and greens taste much better than the supermarket purchased ones. I love this! I always get so sad when my CSA ends and my garden is done for the year I will definitely have to look into this more for our house. Thanks for sharing at the Homestead Blog Hop! Hope we see you there again next week! Thanks for posting this. I will be attempting growing greens indoors this year, and you have given me the nudge of inspiration to get it done, that I needed. Anne Marie, I recommend beginning with lettuce, spinach, and Asian greens as these grow quickly under lights. I’m hoping to create a cool food space in the basement under my new addition, so this is good advice for me. I’ve tagged it so that I can find it easily when I’m ready for it. Jean, it is nice to have a few freshly harvested greens and herbs in the middle of winter. Thank you, thank you, thank you for including all that information! I haven’t ever had an indoor garden before, and honestly, wouldn’t know where to start. Saves a lot of trouble lol. We’ve only worked with the outdoor ones so far 🙂 Pinned, shared, and subscribed! Great post! I’m always itching to grow during the winter months. We are putting in an offer on a house that has a beautiful sunroom and I already have all kinds of plans for using it as a greenhouse. I’m sharing this post across my social media accounts. Have a great day! Missy, I’m keeping my fingers crossed for you that your offer goes through. The sunroom sounds like a wonderful are to grow plants in the winter. Thank you for all this great information! I see the ad above for Main Line Gardens and am wondering if you are in the Philly area. I am local to the area and have a large outdoor garden. I was so sad to lose all my arugula & lettuce in last week’s big freeze! I started lettuce indoors in early october and they are looking good. I will definitely take some tips from your post regarding lighting and layout (mine are very makeshift; in pots and an old fishtank with a small grow light). I found your site from Motivation Monday link-up and I am so glad I did! I will be back. Many blessings to you and yours. De, It sounds like you have a head start on your indoor garden. You lettuce should do fine under your makeshift light/aquarium. The ad at the top of the post changes all the time and is usually based on your browsing history. I’m not too far from PA. I live and garden in Maine. Our garden is finished now too. Thanks for stopping by! Growing veg in winter, especially greens, is something that I have thought of doing but never actually got around to. I am still in the midst of learning so much when it comes to the spring/summer/fall garden, that I look forward to resting (and absorbing all I have learned) during the winter months. Margaret, I usually wait until after the holidays to begin thinking about gardening again. A few years ago, I tested some seeds to see if they would sprout before placing my yearly seed order. I planted the ones that sprouted and enjoyed some fresh greens in the middle of winter. Since then, I try to keep a few trays going under the lights. A very interesting post. I have not done anything as “professional” as this, but if I had space I probably would. I have a smaller-scale arrangement called a “Growlight House”, in which I successfully raise microgreens. They are a poor substitute for outdoor crops, but welcome nonetheless. Mark, You could easily grow some salad greens in your Growlight House. If you harvest by snipping the outer leaves, the plants will continue to produce for a long time. I keep thinking I ought to grow microgreens for the winter. I don’t know if it will happen but it seems like something that would be easy enough for the winter. Daphne, Microgreens would be really quick to grow and a nice addition to sandwiches, soups, or even folded into an omelet. Hi Doug, Thanks for the comment. I love it that you and your wife work together and preserve your harvest. Yes, the last few years the deer have ended my fall garden early. Next year, I am planning on using fencing arched over the beds to protect them. Luckily, I do have some greens in the freezer. I blanch and freeze a lot of chard and kale over the growing season. It is nice to have frozen greens on hand for a quick side dish or to add to soups. I also freeze a lot of extra greens for our chickens to enjoy during the winter months. Not much goes to waste here either.